There are two major unrelated phyla of slime molds. The Myxomycota are the true (plasmoidal) slime molds, and the Dictyosteliomycota are the cellular slime molds. Both were formerly classified as fungi but are now considered protists. Slime molds are often found on old, well-rotted logs because there they can find the moisture and bacteria required for survival. Their small, delicate fruiting bodies tend to be fungal in appearance. Most of the fruiting bodies are only a millimeter or two in height, and therefore often difficult to notice. 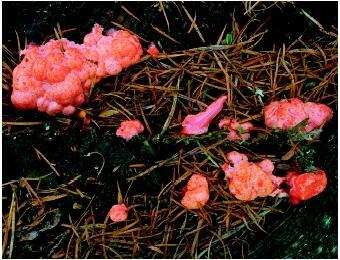 Pillows of the coral-colored slime mold Myxomycetes grow on damp wood. bodies form. These fruiting bodies produce dormant, resistive spores. These later germinate to form uninucleate myxamoebae or flagellated swarm cells. These later fuse and then divide mitotically to form a plasmodium, completing the life cycle. Myxomycetes are important scavengers in dark, damp parts of the ecosystem . Occasionally, during rainy periods, large plasmodia (up to a few meters in diameter) crawl out of the woods and into people's lawns and gardens. These plasmodia were the inspiration for the science fiction movie The Blob and are eaten in parts of Mexico. The Dictyosteliomycota are also known as the social amoebae. Their life cycle is considered among the most bizarre among microorganisms. It begins with free-living amoeboid cells (not to be confused with the Amoebae); there is no true plasmodium. As long as there is enough food (usually bacteria) the amoebae thrive. However, when food runs out, the amoebae send out chemical signals to surrounding amoebae. Next, they stream toward a central point and form a sluglike multicellular pseudoplasmodium, which can then migrate like a single organism. When conditions are right, the pseudoplasmodium stops migrating and forms a multicellular fruiting body. Some of the cells become spores that disseminate, while the rest form stalk cells whose only function is to raise the spores up into the air to be more easily caught in air currents. The Dictyosteliomycota pose an interesting challenge for evolutionary theory, since some of the cells (in the stalk) actually seem to sacrifice their own reproductive potential so that others (the spores) can be transported to a new location where there is more food and they can grow again. This altruistic sacrifice would seem to be counter to the reproductive interests of the cells that became the stalk (because they never reproduce) and genes for stalk-forming behavior would therefore be selected against. It may be maintained if the spore cells are closely related to the stalk cells (and thus both have the stalk-forming genes) or if the allocation of cells to spore versus stalk is random, so that genes for stalk formation are preserved over time. However, evidence suggests that the position of the cells in the slug and thus in the fruiting body is determined by the timing of their coming into the aggregation stream, rather than by genetics. Farr, M. L. How to Know the True Slime Molds. Dubuque, IA: William C. Brown Publishers, 1981. Keller, Harold W., and Karl L. Braun. Myxomycetes of Ohio: Their Systematics, Biology and Use in Teaching. Columbus, OH: Ohio Biological Survey, 1999. Raper, Kenneth B. The Dictyostelids. Princeton, NJ: Princeton University Press, 1984. Stephenson, Steven, and Henry Stempen. Myxomycetes: A Handbook of Slime Molds. Portland, OR: Timber Press, 1994. Volk, Thomas J. Tom Volk's Fungi. <http://www.wisc.edu/botany/fungi/volkmyco.html> . I have discovered and photographed a slime mould, possibly fuligo septica on the isle of Lewis, Scotland. if you reply with an email address i could attach the images and perhaps someone could verify this is indeed what i found? It is a good article about moulds, but if u can add some pictures and difference between acellular and cellular slime moulds in a table format it will be more convinent for us to study. yes, please add some pictures for more details about wat you showing about..